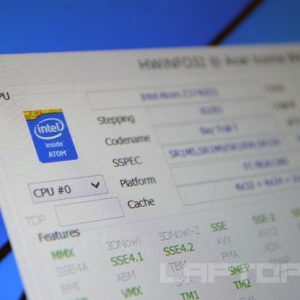 The Intel Celeron N3050 and N3060 belong to the 14-nanometer “Braswell” processor family and bottom of Intel’s laptop CPU lineup. The dual-core chips are clocked at 1.6GHz base speed. The boost speed on the N3050 goes up to 2.16GHz, while the N3060 can go up to 2.48GHz. Regardless of the clock speed differences, both chips perform similarly, with the N3060 being only a tad faster. Generally, the CPUs are suitable only for the basic home and office computing operations, very similar to the popular and older Celeron N “Bay Trail” 22-nanometer series. As same as the other Braswell parts, the Celeron N3050 and N3060 consume 6 Watts of power, as opposed to 7.5W of Bay Trail CPUs. Therefore, they are power-efficient processors and that’s their best feature besides low cost. The chips are used in various budget notebook PCs, especially those with small displays and casings. We have tested the Celeron N3050 in an HP 15 laptop configuration with 4GB of RAM and a 500GB 5,400rpm hard drive. As noted previously, the N3060 runs only slightly faster. The difference isn’t noticeable during real-world computing activities. As you can see in the video, the N3050 paired with 4GB of system memory can handle the daily tasks well. It provides sufficient power for running multiple web browser tabs with heavy web pages opened, Office applications, and even some photo and video editing. However, applying image adjustments and effects and video exports take some time, so the CPU definitely isn’t recommended for that type of activity on regular basis. With the current video drivers, the chip has some high-definition video playback issues. For instance, playing 1080p and 4K YouTube videos VLC Media Player program and in Google Chrome web browser produces very high CPU loads and dropped video frames. On the other hand, in Microsoft Edge browser these videos run smooth with much lower CPU load. Also, the reviewed N3050 and its Intel HD integrated graphics struggled with running most of the popular games, even some relatively light titles. Again, future driver updates might bring improved gaming performance, but currently you can play without big lags only League of Legends and Minecraft among the blockbuster games. We have also tested Dota 2, Skyrim, and Counter Strike GO. The processor and its IGP weren’t able to achieve gameplay at above 20 fps in these games. Temperatures were quite low, even during heavy 10-minute CPU load while converting a video file with 100% CPU utilization. The CPU temp was 46 degrees Celsius on idle and up to 57 degrees during the video conversion. Check out systems with the Celeron N3050 and Celeron N3060. The N3060 with its integrated graphics is among the worst processors for crypto mining. Maybe you’ll be able to run a mining program, but mining will be very very slow. I bought a refurb Chromebook with the N3060 and 2Gb RAM. Yeah Chrome loads pages pretty slow with the CPU. But a positive is that if you just want to watch SD streaming and do nothing else it work OK. Even 720p works fine. But trying to surf the web with some complex web sites tries your patients in loading times. Even a basic minimalist OS like Chrome needs a faster and better CPU. i have the n2840. it is a disgrace. it stays at 100% with no aplication open. pure garbage. You dumb,you choose windows 10 for CELERON!!!!! Yeah ! You dumb ! Windows 10 cannot be on celeron. which adobe can’t run well on this processor ,…. No, you can not play high-quality games or use it for auto cad. It’s supposed to be a simple notebook for simple tasks, like web browsing, email, youtube videos, writing, just simple tasks. For the price, it’s not bad at all. However, you need more memory than the standard 2 GB if you’re going to use Windows 10, and install a solid state drive to speed things up. I personally would upgrade the memory to the max, install an SDD hard drive, and ditch windows for a lightweight Linux distribution. Windows like to gobble up RAM. A lightweight Linux Distro would cut all the fat from the OS, keeping things light on memory consumption and without unnecessary running tasks; like what windows is good for; you have plenty of RAM and processing power to get things done. You’ll have trouble with Windows 10 on this system because of the Antivirus program constantly running in the background, scanning every file. You don’t need to use an Antivirus in Linux, saving processing power and RAM. Is it possible to upgrade CPU? is the socket type of celeron compatible to core i series? No, it’s not possible. Modern laptop processors are soldered onto the motherboards and upgrades are not supported. The same applies to Celeron to Core i upgrades. I got this PC with the dual core version of this CPU. It started off alright but started to nose-dive pretty quickly. Low graphic games can scrape around 28 FPS, but after playing The Sims 4 it ran an average of 14 FPS. Not very good at all. I wouldn’t recommend this CPU. Is celeron N3050 suitable for autocad? Can I use the HP N3060 for displaying images for outdoor security cameras? Will the images be clear or choppy? Do you actually mean displaying camera videos? If that’s the case and if you have multiple cameras, I don’t think laptops with the N3060 are good for that. This is one of the slowest processors and running multiple videos can be a too demanding task for this processor. 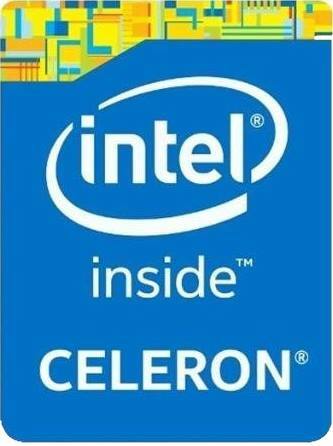 Is it celeron is best? No, actually. It’s one of the slowest notebook processors. But, it is faster than some older Celeron models. which generation is it? some of my friends told me that its 6th generation laptop. is it true? 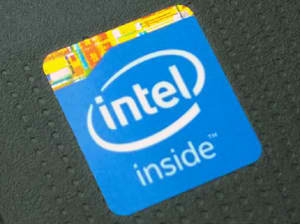 Officially, 6th Generation is one of the versions of the Intel Core series. For year 2016. That’s a different class of processors. 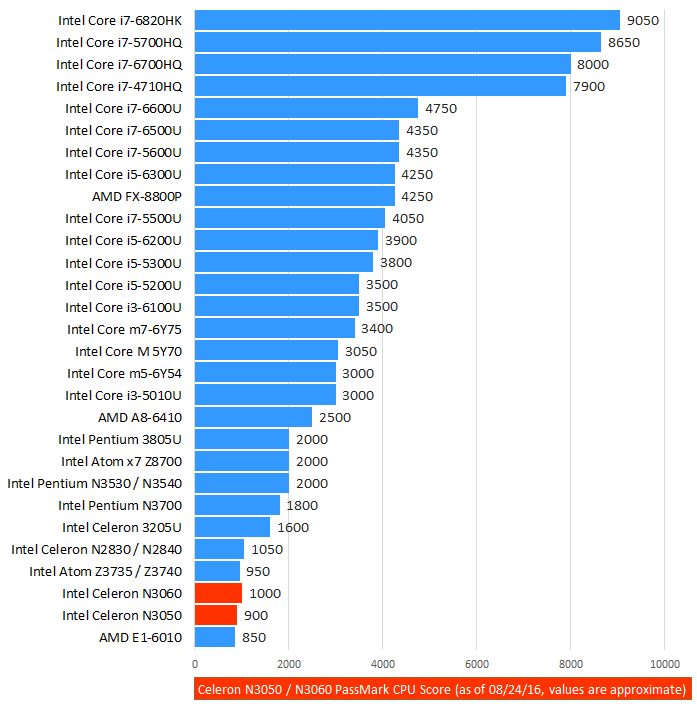 Intel Core are mid-range and high-end CPUs, while Celerons are entry-level. The N3050 was available since 2015, while the N3060 became available a little bit later. Around the same time the 6th Gen Core became available. Can I play GTA 4 and GTA 5 On this processor?? GTA 5 is completely unplayable, the CPU and its integrated graphics are too weak. I haven’t tested GTA 4, but I can guess it can’t run properly either. The N3060 is soldered onto the motherboard, so you can’t replace it. Sorry. Most modern laptops don’t have replaceable CPUs. The CPU will be able to run the game, but it is slow for smooth gameplay. You’ll definitely see some choppiness. can i use adobe programs well with celeron? Is n3050 faster or slower than atom z8300 since the latter is quad core? The Atom Z8300 is slightly faster, primarily due to number of cores. But, the Celeron N3050 is clocked higher, so difference in everyday tasks is barely noticeable (~1200 vs ~950 PassMark CPU test points isn’t a huge gap). On the other hand, the N3050 has dual-channel memory support, whereas the Z8300 is single-channel only. This can make a noticeable difference in gaming in favor of the N3050, if you get a laptop with it and 2 RAM modules. Still, only select light games are supported in both cases. Do you know how i can update this driver? can i play call of duty mw3 or any 3d games in intel celeron n3050 with intel hd graphics? Since the N3050 struggles with even light titles like CS GO, it’s clearly not a good CPU for gaming. 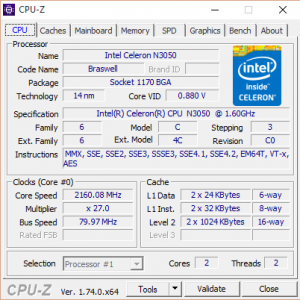 can i play call of duty mw3 or any 3d games in intel celeron n3050? does it handle Netflix/videos well? I found the N3050 is capable of playing videos well, even on high resolutions. However, some software (codecs) related issues may occur when playing YouTube videos in Chrome browser and VLC media player, making high-resolution videos quite choppy. So, I would recommend using Microsoft Edge or other browsers for online videos and avoiding VLC media player for now (until some software update which will eventually fix the issue). I’m running Ubuntu Linux (with XFCE) on this processor with only 2GB RAM. It performs extremely well with Youtube, Chrome browser and VLC. Netflix in Chrome is perfect. I think most of the problems with this processor, especially with lower amounts of RAM, come from the high overhead of the Windows operating system. Linux takes up less than 1/3rd of the space on the SSD compared to Windows and loads in seconds. Ok, you’re not going to be playing games on a N3050 machine but for just about everything else, it’s fine. can we play dota 2 with this stuff? Yes you can, but performance will be quite choppy with less than 15fps most of the time on lowest graphics settings. Take a look at the 3rd video in the gameplay playlist under the Description tab of this page. 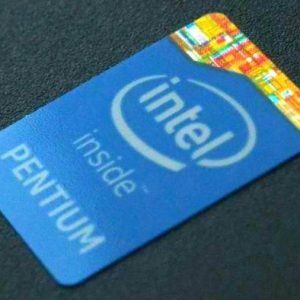 Is it intel celeron N3050 processor will supports MATLAB or not?if it supports what requirements are needed? Their site says MATLAB runs on any modern Intel or AMD CPU and only 2GB RAM. So, any laptop with the Celeron N3050 and at least 2GB of RAM supports it. 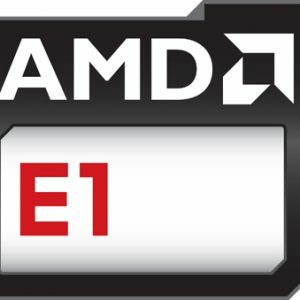 Wont the cpu perform better in real world scenarios when it is not running screen recording programs and rendering the video or running fps programs? Hi, the videos weren’t recorded with any recording program on the tested laptop, but via HDMI output to a dedicated capture card on another computer. So, the videos show real world use, without slowdowns due to software-based recording. The only non-standard thing running was Riva Tuner – simultaneously with games. But it was just showing fps values without recording and affecting shown performance in any meaningful way. The N3050 / N3060 series has overall weak performance, but also low price, low heat, low power consumption, and fanless design capability. Based on that and other impressions described in the full review on this web page, I’ll give the N3050 / N3060 series 3 stars.